I am switching to summer (DE) seats shortly in my '07 997S (and also in the CaymanS). The summer seats do not have thorax airbags and will turn on the airbag light - which I know can be reset at the dealer. But not liking the easy route, I purchased the Recaro airbag resistor kit (link below). Unfortunately the instructions are generic, so I need to know which wires under the seats are for the airbag including its ground. I think I'm looking for 3 wires. FWIW my seats are memory power heated standard seats; the CaymanS has manual heated seats (seems like the back adjustment is power, but I'm not sure). 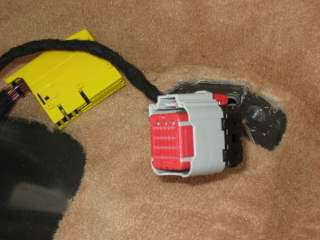 The first photo is the main connector - car side. I know the seatbelt connector is the rectangular part at the bottom - two pins. I think the seat airbag might be the next block (sort of L shaped) with wires - from the bottom updward in the photo - yellow, black, brown, brown. So I'm thinking the bigger block, which has spade connectors in it, is the seat heaters. This is from the Cayman with manual, heated seats. The second photo is both connectors. I'm pretty sure the cube is for the passenger weight sensor for the front airbag. Partly because there isn't one of these on the drivers' side (just the big yellow connector), and partly because the gizmo it plugs into has a label I could partially read "weight" on under the seat. FWIW the big yellow connector has "Tyco 1452494-1" and "BMW 6 925557" and "02" on it. My local BMW dealer parts dept doesn't recognize the number. Tyco online recognizes their number but has no info available (probably just an OEM part). Anybody have any clues here? BTW, Sube says they won't take these parts back, so I've got to figure this out or find something fun to do with them. 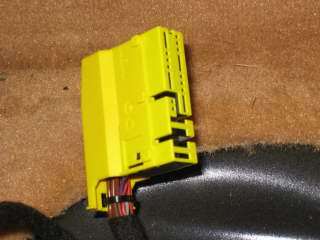 ideally I could get 4 connectors for the airbag part (I'm assuming its that middle, sort of L shaped part of the yellow connector) and then splice in the Sube/Recaro part. I really don't want to cut the harness! But I'm open to any suggestions.